When someone learns I publish e-books, one of the first questions I’m asked is simply, “How?” I’ve given advice on the subject to many authors seeking to self-publish their stories in electronic format, but my general replies never seemed to be enough. People want in-depth explanations, from start to finish, on how to format their stories into e-books: how to lay out the books so others can access them, how to convert the books into a variety of e-book formats, and where to sell the finished product. After one too many e-mails soliciting advice, I realized what seemed second-nature to me wasn’t necessarily as intuitive to others, so I decided to write this book. Be warned -- it isn’t the end-all, be-all of publishing guides. It isn’t going to make you millions overnight so you can quit your day job and write full-time. Hell, it may not even tell you anything you don’t already know. But it will explain to you in no-nonsense detail how I personally create an e-book from beginning to end, how I format a book into nine of the most common electronic formats, and where I publish my stories online. 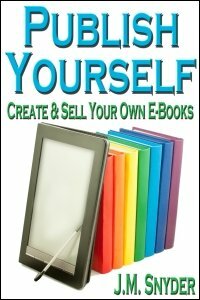 Following the instructions in this book, you will be able to create and sell e-books, too. Sure, there are other publishing guides out there, but many of them are overpriced and don’t offer any real assistance. I’ve never understood why someone who spent little or nothing creating an e-book thinks they should make $15 or more per copy. The beauty of an e-book is that there are few, if any, overhead costs, and 100% of what you earn, you keep. Many distributors have no set-up fees, conversion software can be found online for little or no cost, and the techno-savvy person can generate an e-book without spending much beyond what they’ve already paid setting up their home computer. So why spend an arm and a leg to learn how to do it? You may think my sharing the process with you is tantamount to giving away trade secrets, but I don’t see it that way. There are always going to be writers who want to work with publishers -- people who don’t want to bother with the creation and marketing of books, who don’t want to go through the hassle of dealing directly with multiple distributors, who don’t want to muck about with cover art and interior design and whatnot. People who only want to write and will leave the messy and sometimes complicated business of getting their words into print to someone else. This book isn’t for those writers. Instead, it’s for people like myself who enjoy controlling every aspect of writing, from a story’s inception through to seeing it published. People who want to learn how to format their own stories, who want to track their own sales, who want a more hands-on approach than what is offered through traditional publishing venues. People who have already self-published a book in print but now want to explore the budding world of e-publishing. People who want to keep more of their profits. People who believe in their own stories and are going to get their books out there for readers regardless of whether or not a publisher decides to take them on.